Today is Columbus day in the United States, celebrating the day that Christopher Columbus reached the New World. In Berkeley and some other Leftist enclaves it is Indigenous People’s Day, in which Western Civilization is condemned for its many crimes against humanity. Columbus Day is no big deal, just a three day weekend for banks and such. Still, should we honor Christopher Columbus with a day? I think we can absolve Columbus of the destruction of many Native American cultures and peoples. That was inevitable. Europe’s sailing and navigation techniques were advancing rapidly and it was only a matter of time before someone stumbled across the Americas. Since the natives were centuries behind in technology and had no immunity to smallpox and other diseases the Europeans brought, they were doomed. They weren’t entirely helpless victims though. They did fight, with varying degrees of success. But between between the massive death toll from disease and their own disunity, often they were more interested in using the guns they acquired from European traders to fight traditional rivals than the Europeans, the Native Americans were doomed. Still, Columbus did set the pattern by enslaving the natives of the islands he discovered.From the Wikipedia article there is this excerpt from his log. He seems not to have been a very good governor of Isabella, the first Spanish colony in the New World. He was charged with excessive cruelty and sent back to Spain in chains. These charges might be false though, since Ferdinand and Isabella felt they had promised him too much reward for his discoveries. Before he set out, they had promised him governorship any lands he discovered. As it became obvious to everyone but Columbus that he had discovered a whole continent, the king and queen wanted a bigger share. Maybe the biggest reason not to celebrate is that he was wrong. 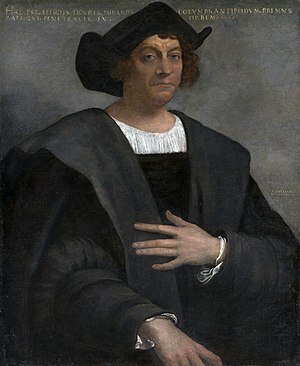 The popular view is of Columbus bravely asserting that the Earth is round against the scholars and intellectuals of his time who “knew” the Earth was flat. Of course everyone knew the Earth was round. The scholars and intellectuals knew about how large the Earth actually was and they knew perfectly well that Columbus was fudging his calculations to make his voyage seem feasible. If the Americas hadn’t been in the way, his voyage would have ended in disaster. For all that though, I like Christopher Columbus. Despite his flaws, and he was only a man of his time, he was brave and he had vision, two qualities that are rare enough in any time, especially our own. So, by all means, let’s celebrate this man and his deeds. This entry was posted on October 8, 2018 at 8:15 am and is filed under Heroism, History, Holidays. You can follow any responses to this entry through the RSS 2.0 feed. You can leave a response, or trackback from your own site.